If you sit at the sushi bar at ROKU and order the omakase, you might find in front of you a plate of delicately rolled fluke sashimi with vibrant yellow and purple edible flowers sprouting out of it. 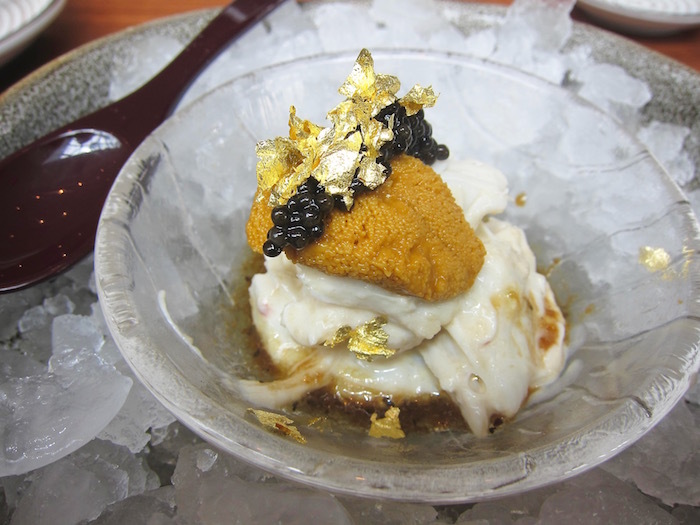 Or a crystal bowl chock full of creamy chunks of blue crab topped with decadent uni, caviar and gold flakes. These thoughtful dishes come from the mind of 45-year-old chef Jiro Kobayashi, who&apos;s been with the West Hollywood restaurant&apos;s parent company Innovative Dining Group (IDG)—which also owns other trendy spots like Sushi ROKU and BOA Steakhouse—since 1998. That&apos;s a lot longer than many of us have held a job at the same company. 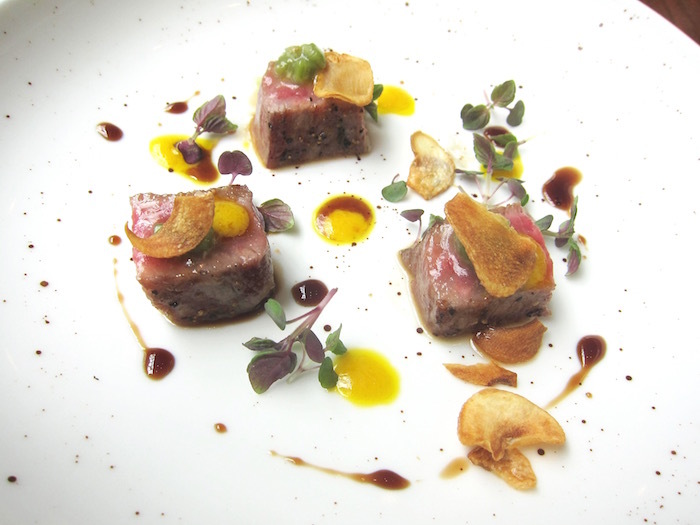 Some of Kobayashi&apos;s plates have modern influences on proteins that go beyond just fish—like seared chunks of juicy Wagyu with a grape reduction drizzled over it. 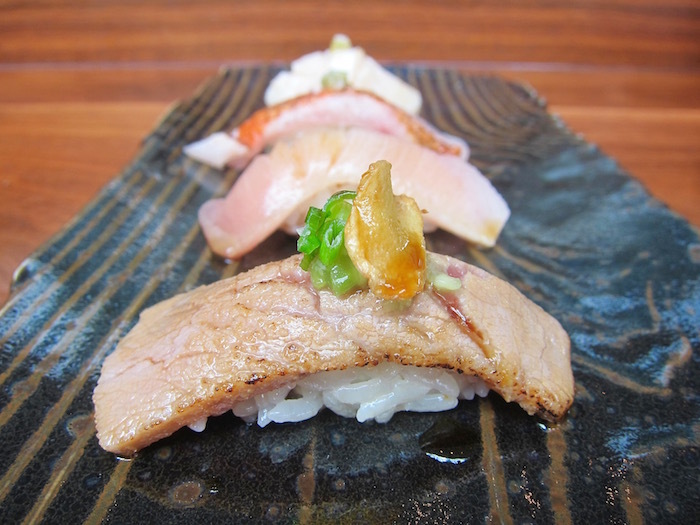 But Kobayashi likes to finish his six-course omakase with a traditional sushi plate lined with slices of fresh fish over rice, like seared yellowtail topped with a fried garlic chip, or a Hokkaido scallop accompanied with a drop of yuzu pepper paste. Kobayashi tells LAist that he takes a modernist approach because "it&apos;s interesting to do something different," but also likes to "mix it up a little and do traditional sushi towards the end" of his omakase. His first love is traditional sushi, and that goes back to his epic journey in Japan, where he undertook a grueling but rewarding four-year apprenticeship at a sushi restaurant located in the coastal hot springs town of Atami. At the time, Kobayashi was only 19. 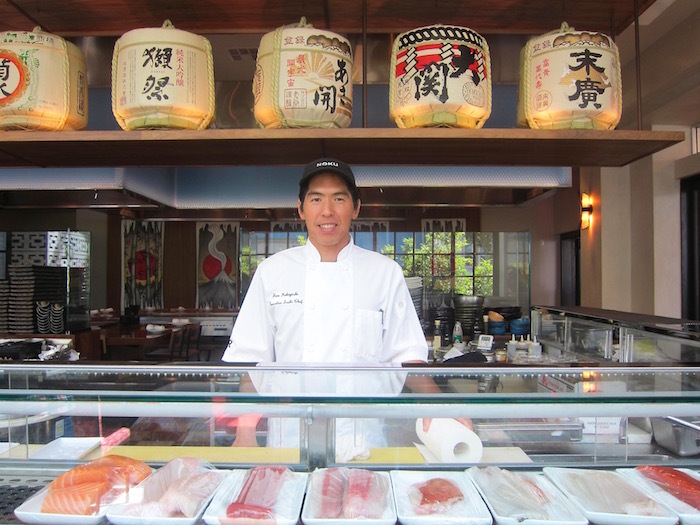 Prior to his apprenticeship, he first got interested in sushi working at a conveyor belt sushi restaurant in Little Tokyo, and later worked under a renowned chef, someone whom Kobayashi asked to apprentice under so he could master the art of making sushi. But he faced discrimination from "really snobby chefs"—this one included—who didn&apos;t think he could handle making sushi because he was first-generation American, growing up in South Pasadena. He recalls the chef saying something to the effect of, "&apos;No way, you&apos;re American,&apos; and laughed in my face." "I&apos;m not going to mention any names but I remember that and that kind of hurt," said Kobayashi. "You&apos;re not even giving me a chance." Kobayashi wanted to prove them all wrong, and set out to leave for Japan to get an apprenticeship. His own mother, who was born in Japan, wasn&apos;t stoked about Kobayashi leading this new path. "She knows the culture and how intense it is to work there and she didn&apos;t really want me to deal with that hard work," he says. But he still embarked on a trip to Japan anyway. Over the next four years, he would work six days a week and over 12 hours a day, doing "really intensive work," Kobayashi says. He would do the same tasks day after day, like cooking rice or making the tamago (omelet egg). "It was kind of monotonous, like, &apos;God, why am I doing this same b.s. everyday?" Kobayashi recalls. He remembers being impatient at that age, blowing up with anger at times. He quit twice at the restaurant, but would return, apologizing and asking for his job back. They took him back each time. "Those are the struggles you kind of go through in just growing up in life, and you have to think to make the right choices," Kobayashi says. "When you make the right choices you become a bigger person [and then] you succeed. So, you just have to struggle. You learn your patience and definitely build a thicker skin." Kobayashi started off shucking oysters and prepping smaller fish like sardines, but eventually moved up to getting the opportunity to filet bigger fish and do larger tasks. "Then I fell in love with the culture most of all, the beauty of Japan just in general, and how detailed everything was in Japan, how the work ethic was over there, how it was so intense and how much they&apos;re so much into perfection and wanting to be the best at what you do," he says. "That&apos;s what encouraged me to do what I&apos;m doing now." After his stint across the Pacific, he moved back to the United States, working at sushi restaurants throughout Southern California, before landing at Sushi ROKU as a sous chef in 1998. Kobayashi moved up the ranks to executive chef, and most recently landed the same role at IDG&apos;s ROKU, a sushi-and-teppanyaki restaurant that opened on the Sunset Strip last November. Nowadays, he doesn&apos;t care what other people think. While he still has a passion for traditional sushi, he admits that he does things that other classically trained Japanese chefs don&apos;t. He may top a cube of crispy rice with seared foie gras and a dollop of sweet kumquat jam, or add more Western herbs like cilantro or basil to his offerings. 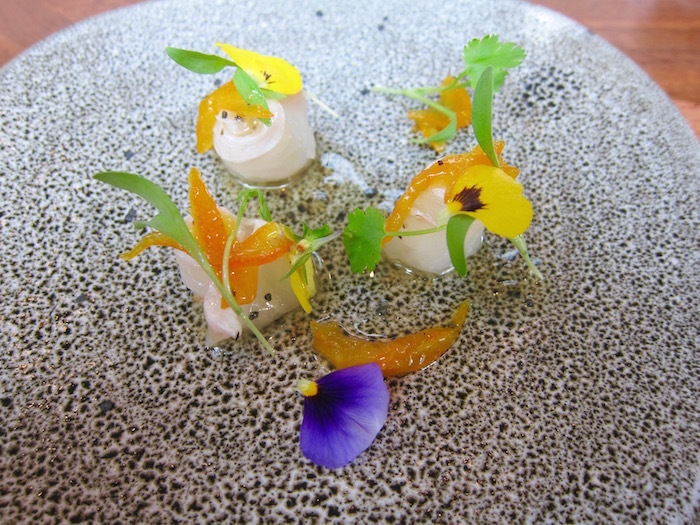 But he says he always brings Japanese ingredients, like yuzu or shiso leaf, into the fold. Kobayashi wants to start integrating ingredients into this dishes that aren&apos;t as popular in the forefront right now, like ankimo (monkfish liver). To him, ankimo could become as hot as uni. "I&apos;m constantly excited about working with fish every day," he says. "I&apos;m excited every day about setting up the sushi bar and filleting every big fish that I have... That&apos;s when ideas come up, like, &apos;Oh, what can I do with this fish today?&apos; So, every day, it&apos;s something new." ROKU is located at 9201 Sunset Blvd, West Hollywood, (310) 278-2060. The six-course omakase plus dessert is $80, and is offered for lunch and dinner.